Enables evaluation of XPath expressions against the active text editor containing XML. By adding the following code below to your website you will be able to add an install button for Eclipse XPath evaluation plugin. Because Eclipse "Sorry, we do not allow comments to contain external links [URL]. Feel free to edit your post." I added some" " in the link. does anyone know the solution to this? Did you make it work? I've just tried the installation and strangely faced the same problem as you. So I canceled the instalation, re-tried it again and interestingly this time it went through without any problem. Probably just some network issue (DNS issue?). It doesn't seem to be the plugin's problem. Hey, I have tried it again, but nothing changed?! I've tried it again. This time on different computer and different network and I managed to install it successfully without any problems. Can you make a new fresh eclipse installation and try to install the plugin through the Eclipse Marketplace? Just to see if there is any issue with your current eclipse installation. I'm running out of other ideas.. I'm learning XPath and looked for an interpreter and this one gave me a first contact with it but apparently it has issues and interpreting XPath functions. Retyping the queries from the video I cannot get a result and in the video it appears well. Now I've looked at the syntax of the concat function and I don't understand what's going on. Either it states that I can't use a single argument, Either it states that I am restricted on the first one, either it returns only the number of result but does not display the data. So it seems it is buggy. 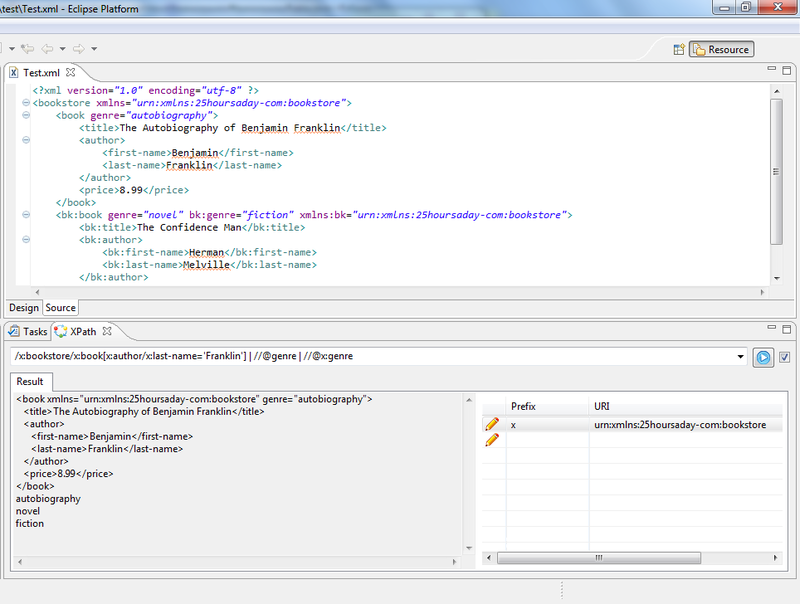 You can reproduce what I'm saying by downloading this XML file and trying that query for instance. concat(/mondial/country[population < 10000]/name,' test ') <- Returns msg "A sequence of more than 1 item is not allowed as the first argument of concat()"
/mondial/country[population > 300000000]/name/concat(name,' -> ', population) <- Just returns the number of elements in the resultset but do not display the data. Hi, thanks for reporting the issue. I've just found there is really a small bug regarding this. For now when evaluating the XPath query, please make sure the "Pretty Print" is turned off! Therefore uncheck the checkbox on the very right side next to the "Run Query" and "Load Namespaces" buttons. This is causing not showing the results, I will fix this soon. 1) Here you call the concat function at this level /mondial/country[population < 10000]/name and passing "name" as the second parameter of the concat function doesn't make sence at all. You may want to change the second parameter to "text()" and you'll get the country name instead (in fact that's the textual content of the "name" element. 2) I believe you want get the population of those selected countries. The problem in that XML file is that there are multiple population elements in each of the country elements. And you can only pass an atomic value to the concat function. Therefore you have to select only one "population" element (selecting it either by year attribute) or just the last one being listed in there. This issue has been fixed in 1.4.5. Feel free to upgrade to the latest version. installation errors - any pointers? Re: fred ted's picture installation errors - any pointers? I don't know why the other URL (reported by you) doesn't work anymore, but I've just tried this new URL and I was able to install the plugin successfully. Let me know if you will be able to resolve the issue with this. Version 1.4.1 has been released! The reason for this is, that the plugin (and its update site) has been moved from Google to Github and it wouldn't get updated to this latest or future releases. Re: Version 1.4.1 has been released! I forgot to mention that starting from this version the support for Java 5 HAS BEEN DROPPED! If you need to run the Eclipse with Java 5, please don't upgrade to this nor future versions, as it might cause problems in the functionality of the plugin. I get always an exception when running the namespace loader. An internal error occurred during: "Namespace loader". Any hints for solving the problem? Hi, I have already fixed the issue with the Namespace loader. Please update the plugin to the latest version 1.4.1. Please, see the release note above, as it's necessary to uninstall the plugin first and then install it newly again. Hi, I believe you are using Java 8, right? It seems the issues is related to this bug https://saxonica.plan.io/issues/1944 in the Saxon library. I've just tested that on my system and it works well with the modified eclipse.ini file. I will try to fix the issue soon though, so the workaround won't be needed. I hope, it helps! When a file has a default namespace (xmlns="something") without prefix nothing is selectable. Even when adding manualy the namespace value association with an empty string. Hi, thanks for reporting the issue. It has been fixed. Please, update to the latest version 1.4.1. Please, see the release note above to correctly update to the latest version. - would be nice to have options to ignore namespaces, etc. Thanks for suggestion. I've just released new version 1.3.0 which contains a new button to load all the namespaces from the current file, so no need to enter those data manually anymore. A list of the returned XPath objects would in some cases be preferable, the raw xml is a lot of clutter if you are looking for all results of a complex query. A simple 'Number of results' in a Text widget would already be a big improvement. In total: very nice plugin, also without the above request. Great that the namespaces work like they should (a feature that many online XPath evaluators miss or don't implement right). Drag&Drop from the browser into Indigo also worked fine for me, chiq. Can you, please, let me know more specifically what you mean by "list of returned XPath objects"? Looks good, I also installed it via Drag&Drop from the browser successfully into Indigo. Why haven't you converted the Google Code Project into EclipseLabs btw., or started there in the first place? Thanks. Yeah, I think I should have done that. Well, I'll check the possibilities of moving the project under EclipseLabs.